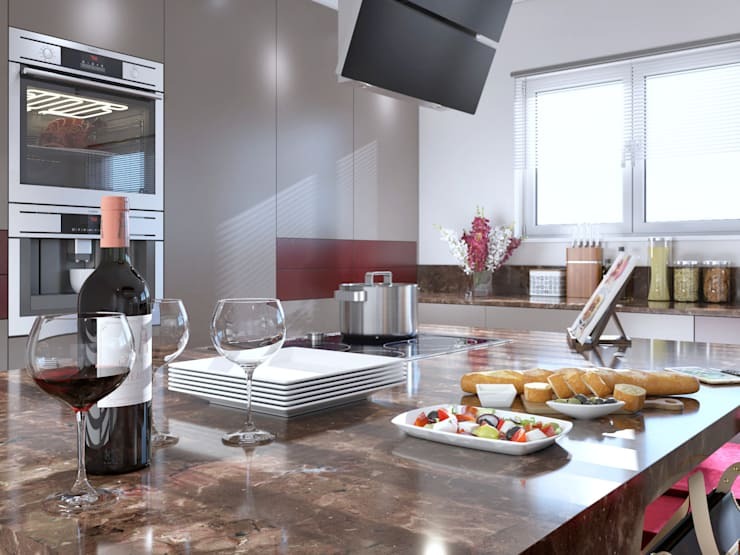 A palate for delectable cuisine; socialising with exceptional company; the tantalising flavours of incredible wines—these were part of the inspiration that kick-started a kitchen design by Durban-based professionals Linken Designs. Knowing all too well that the heart of any home is about more than cooking, these seasoned pros illustrated via their design that a kitchen must also reflect one’s lifestyle and personality. But perhaps more important was the fact that their design reiterated a little-known fact: you do not have to have a gigantic kitchen in order to enjoy a luxurious one. Let’s see how the clever use of luxurious materials (like marble), high-gloss cabinetry, and a few stunning velvet bar stools took this kitchen design from ordinary to out of this world. We do not have anything against neutral or earthy colour schemes, but far too often the modern design dabbles exclusively in these subtle tones without being just the least bit daring. 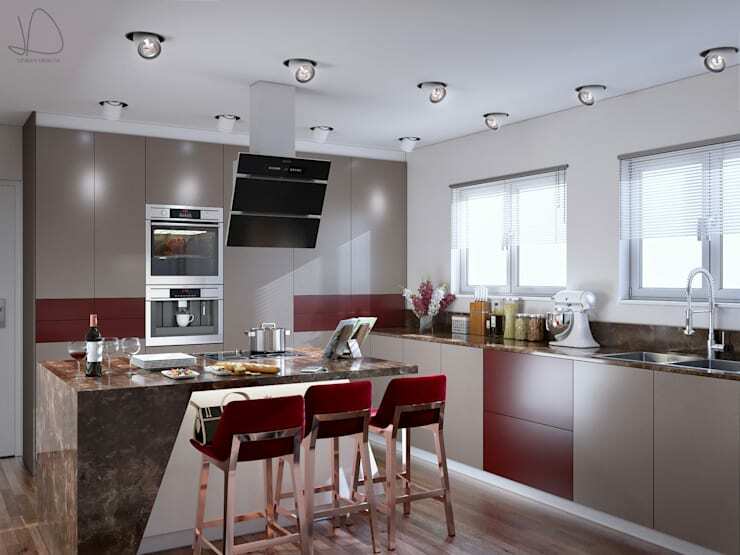 This design proves to be the exception, with a firm amount of cherry reds ensuring contrast and character in this modern cooking space. 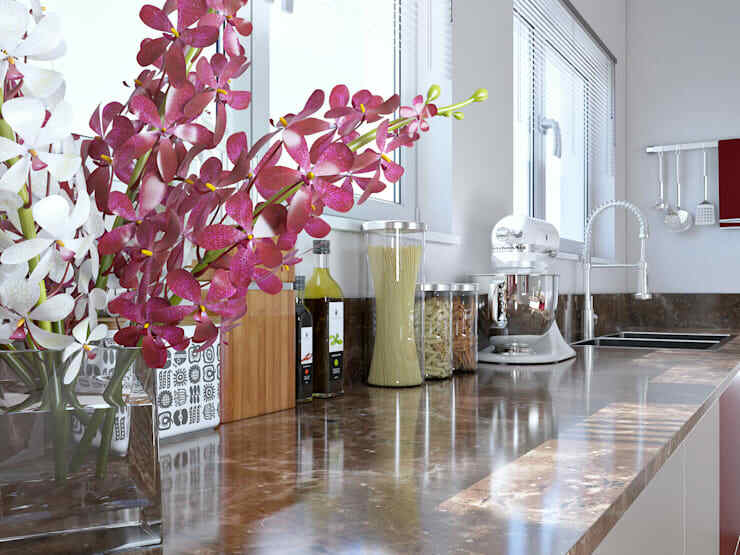 Any homeowner fortunate enough to have a kitchen island knows how super practical it can be. Case in point, this luxurious design (complete with marble countertop) which functions successfully as a prepping space for all meals, an informal work station, a dining area, a homework hub for the kiddies, a presentation surface for a variety of dishes, etc. And what would any kitchen (modern or otherwise) be without a batch of clever appliances? 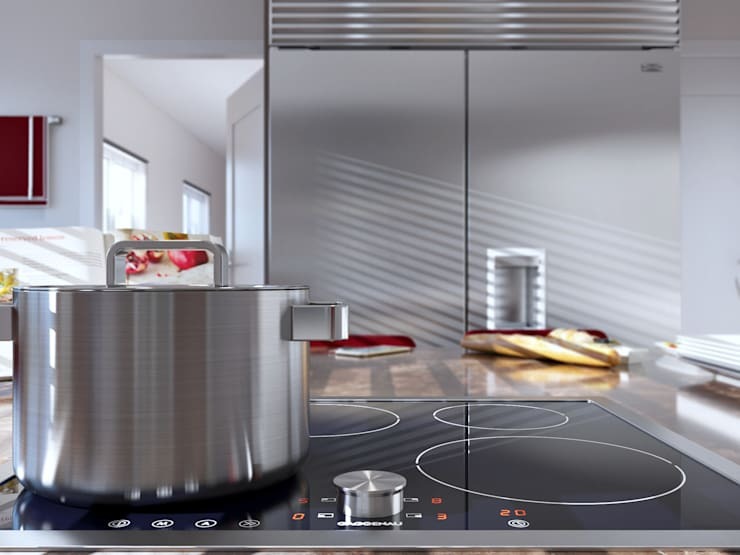 Stainless steel was chosen for this particular one’s goodies, ensuring a healthy dose of shine, as well as evidence that all things related to cooking (and baking) will be implemented with the utmost precision. Careful to steer far away from the clutter factor, these countertops flaunt a handful of kitchen accessories and decorative that aid in the space’s functionality and visual aesthetics. 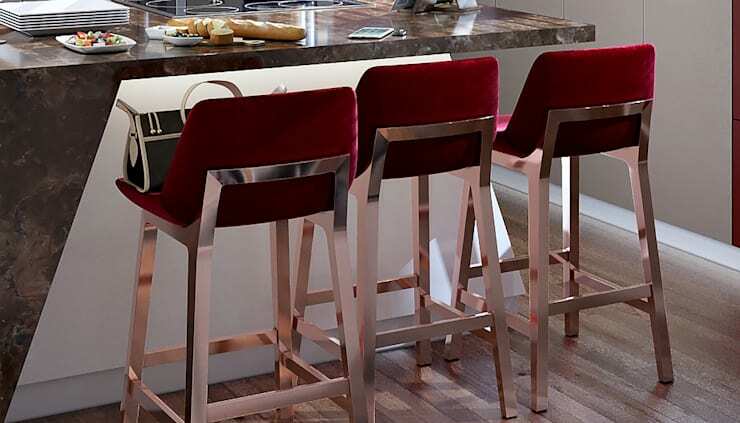 Last but certainly not least, those velvet bar stools (in the same bold cherry red) that enhance this kitchen’s comfort factor by quite a few levels. What else could possibly be required for a stylish, modern cooking- and socialising space of the 21st century? In the spirit of functionality (and hygiene), let’s see the proper ways to go about Cleaning Your Kitchen Equipment.